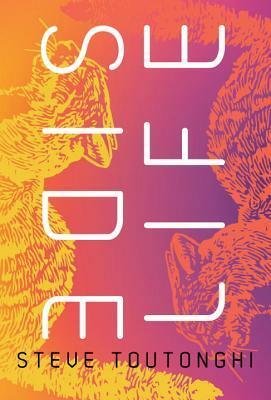 Weekend Birding: What Is That Ugly Bird? By the end of August you may notice many of the birds are looking a bit shabby. Bald patches and scruffy looking feathers and even a few pieces of down fluff poking out. There’s nothing wrong with your birds. It’s molting season. After a busy summer of nesting and raising young a bird’s feathers get a bit tattered and worn. Migratory birds have had the added wear and tear of a long journey to their nesting grounds. Most robins don’t look as bad as this poor guy does. He seemed fine other than being a bit naked. He had a beak full of worms and was on his way home to feed the youngsters. It’s possible this was a first year bird. Their feathers tend to wear out faster than an older robin. This is because their adult plumage grew in quickly after the juvenile plumage molted the prior year. 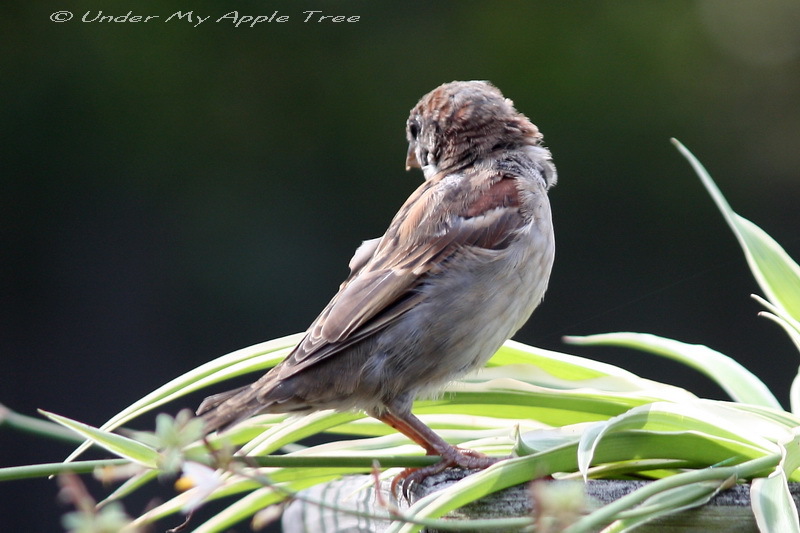 This sparrow is growing his new feathers for winter. Healthy, clean feathers keep a bird warm and water resistant. 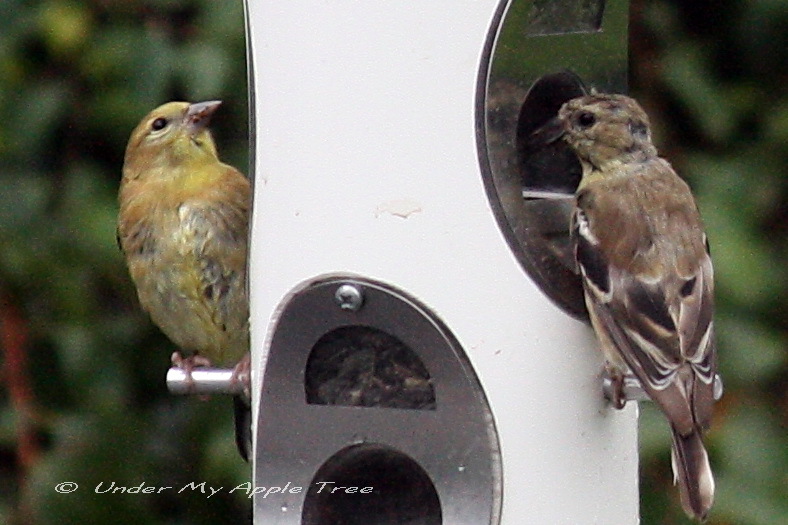 The little goldfinches, so bright and beautiful in the summer, are beginning to turn a brownish color. Poor Mrs. Cardinal wasn't looking too good this day. Her usually perky crown feathers had fallen out, her body feathers are scruffy and her tail looks shredded. This photo is from last year. She looked even worse before her new feathers grew back, but within a few weeks she was looking beautiful again. Why do birds molt? Because feathers wear out and cannot heal when damaged and need to be replaced. Feathers are not alive, they are similar to hair or nails in humans. How often a bird will molt depends on the species but most molt once a year. Some species will molt twice a year, an example is the Goldfinch, and others will do a partial molt before breeding season. When do birds molt? Growing new feathers requires a lot of energy so molting takes place during less stressful times such as after nesting is complete or before migration. Usually birds lose only a few feathers at a time and the molting is inconspicuous. Sometimes it’s not a neat, orderly process as you can see from these photos. For more bird photos check out my previous Weekend Birding posts. Fascinating post, thank you! I’m so relieved to know the cute little guy in the top photo is carrying worms in his beak and he isn’t sick or anything, just molting…very intriguing! It’s so interesting how mother nature works…birds going through a scruffy, ugly period to ready them for winter. Amazing! Most birds never look that bad. He was probably a young bird – their first set of adult feathers are not as durable as an older bird. Or he could have had another problem I’m unaware of, but he was flying around just fine. I’ve never seen the molting process. 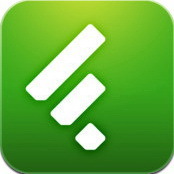 You’ve spotlighted it so well! Thanks for sharing. Most birds molt slowly, a few feathers at a time, so you wouldn’t notice it. That poor little robin I saw looked stressed out… perhaps from feeding his big family! Do non-migratory birds molt also? Yes, even the non-migratory birds molt. Poor little Robin. No wonder I’m finding feathers in my yard. I’m seeing a lot of them now. The doves are losing their large feathers. Very interesting pictures and information. I’ve never really thought about birds molting. I will keep an eye out for them. Most of them do it discretely and unless you look close with field glasses you won’t notice it. 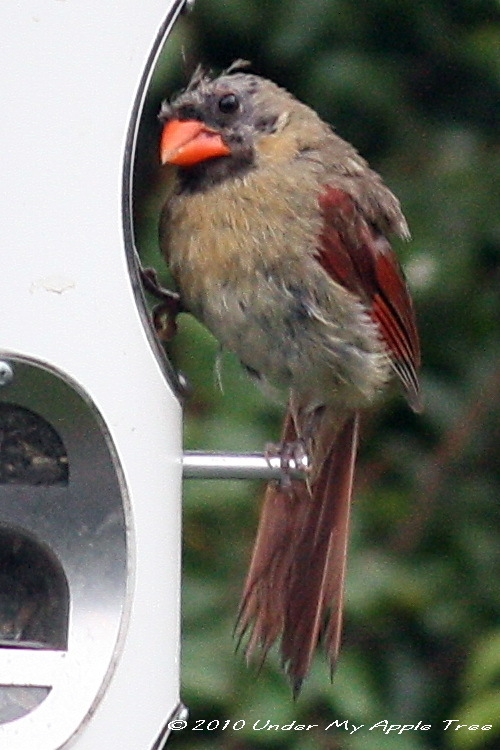 Mrs. Cardinal does look a little hungover! That poor scruffy robin. Thanks for the education on molting Leslie. That’s too funny! But it’s true that in many species the males do a partial molt in the spring to get their pretty breeding plumage. They also stop singing after mating season ends. great post and photos ….birds molt ….more interesting info thanks for sharing that. I loved learning about the scruffy birds. Taking pictures of them was probably more fun than taking pictures of the carefully coiffed ones. 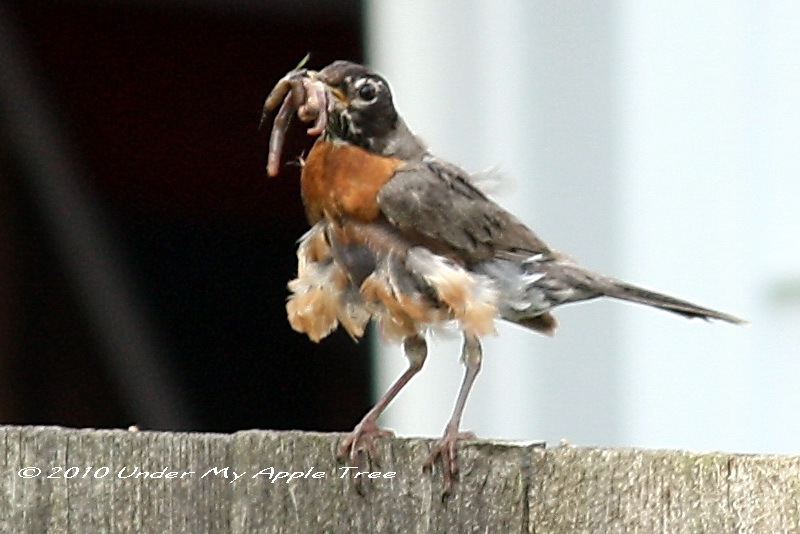 Wow, great shots, and I feel sorry for the shabby little robin. I have never seen one quite like this either. Poor birds! Looks like they’re having a “bad hair day.” Lol. I love the interesting shots you get. I don’t think I’ve ever seen a molting bird before. I don’t think I’ve ever seen a bird look as sad as the first one. I love all the worms in his beak though 🙂 Great post, Leslie! Great post! These poor birds could use a trip to the Fine Feather Salon. Interesting to know that feathers are like fingernails and wear out. Liked the fine feather salon. Can just picture it.